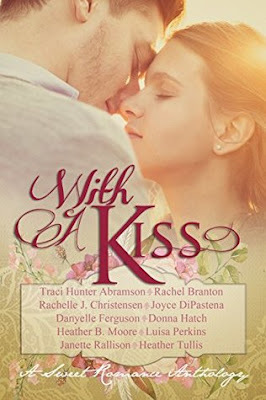 A collection of 10 brand new sweet romance novellas by USA Today bestselling & award winning authors. DANCING TO FREEDOM by Traci Hunter Abramson: A Russian ballerina. An American hockey player. A forbidden romance. Can Katrina follow her heart when freedom is the one thing she lacks? Or will the Cold War cost her the only man she has ever loved? RYLEE’S MIX-UP by Rachel Branton: Rylee Williams didn’t want to be a bridesmaid at her estranged sister’s wedding, the sister who’d grown up with the family she was supposed to have. So why does she find herself in a dress two sizes too big and no date for the wedding? Maybe it’s time to give up on her family once and for all. But a greased pig contest and handsome cowboy Beck Seeger might just change her mind—both about sticking it out and taking a chance at love. THE REFUGEE’S BILLIONAIRE by Rachelle J. Christensen: Shawn Halstrom has an assignment: travel to Atlanta, Georgia to investigate The Heart of Atlanta refugee center so that Burke Enterprises can make a donation. The job should take two weeks tops, but he wasn’t planning on falling for a Cuban refugee named Carolina Diaz. She’s a single mother who isn’t interested in dating, even if the guy might be a billionaire. JUST THIS MOMENT by Joyce DiPastena: Alys’s late husband thought her useful only for spinning thread. Now a mysterious monk has come to take her to a nunnery. Can a sightless woman like Alys exert her independence to forge a future of her own choice? And will the monk, who stirs forbidden longings in her, help or hinder her? ORIGAMI GIRL by Danyelle Ferguson: Josephine loved teaching crafts at the children's hospital until she was assigned to help Dr. Blake learn how to relate with his patients. As she helps the young doctor soften his sharp edges, relax his rigid folds, and open up to the people around him, she finds she can't help but love the man he's becoming. SABRINA’S HERO by Donna Hatch: For weeks, Sabrina daydreams about a mysterious gentleman who frequents the lending library. Is he perchance an agent for the crown? A returning war hero? A highwayman? A fateful public assembly introduces her to the mystery man as well as an intriguing newcomer. Now she’s torn between a charming rake promising the adventure she craves, and a handsome barrister who offers security. Only one will stand by her when it matters most. FALLING FOR LUCY by Heather B. Moore: Lucy Morley’s older sister is perfect, yet Lucy can’t even hold down a job, let alone stick with something like college. After another disastrous firing, she lands her dream job at a bookstore—and it doesn’t hurt that her new boss, Adam Parks, is pretty much her dream man. But if Lucy is good at one thing, it’s guarding herself from heartbreak. Adam has other plans in mind that include finding a way into Lucy’s heart. MY DEAREST EMMA by Luisa Perkins: Since her husband died at 25, Johanna has worked at a busy hotel in the new railroad town of Danube, Minnesota, soothing her loneliness by writing home to her sister in Germany. When she meets August, a shy widower, her letters reveal a budding friendship. But Johanna soon begins to question whether their romance can survive a demanding employer, August’s jealous daughter, and the misgivings of two recently broken hearts. COVERTLY YOURS by Janette Rallison: Paisley Spencer never needed a knight in shining armor—until she finds herself surrounded by three gangsters in a bad part of Phoenix. A handsome stranger intervenes, rescuing her from certain disaster. The only catch? Now she has to pretend to be his girlfriend for the next hour. She finds it’s a job she doesn't want to end. The characters in Dancing to Freedom had a pretty swift start to their romance, but it was the intrigue and element of suspense that drove the plot. I liked learning more about the ballerinas while they toured Canada and the United States. Rylee's Mixup was a fun story of mistaken identity with the charming cowboy and also had some deeper themes with her past of a dysfunctional family and foster homes. I enjoyed Rylee and Beck's banter and chemistry more than the family drama, but there was a good balance between the two. I enjoyed the setting of a refugee center in Atlanta in The Refugee's Billionaire, where Carolina is an employee helping new refugees acclimate to their new country and its culture. Her innovative ideas and compassion attract Shawn and even though he's not really a billionaire, he is successful in his own right. They develop a sweet romance and work together to keep the center alive and growing. Just This Moment is a medieval historical, and I'm always impressed by this author's ability to transport me to the time period and make it come to life. Deception and politics come into play as Alys must be torn from her daughter and ensconced in a nunnery while her daughter is raised in another household and betrothed to the leader's son. As Walter transcribes Alys's life memories to preserve for her daughter, he realizes the injustice of such a strong and clever woman being forced to submit to the will of others. I loved this story and am excited to read more about the characters in the author's upcoming works this fall! Origami Girl is one of my favorites from this collection! It takes two completely opposite people and throws them into situations with some of the most vulnerable and strong individuals- children with cancer. Josephine's positive attitude in spite of her losses is admirable and she uses her talents to inspire and bring happiness to others. I enjoyed seeing her influence on Dr. Blake and understanding how his childhood influenced the person he became. His vulnerabilities reveal someone who needs love and light more than he realized. The children they interact with in the hospital make this story fun and full of heart. I always love a good Regency romance, and this author is one of my must-reads in the genre. This story had hints of Austen about it which was fun to discover. Sabrina was definitely like Catherine Moreland from Northanger Abbey, imagining intrigue and secrets and dreaming of adventure. Her naiveté was frustrating when it came to the gentlemen pursuing her, and there was a Wickham/Darcy dynamic with Mr. Wynn and Mr. Beauchamp. I appreciated the addition of an tragic historical event and the depth it brought to the story. Heather B. Moore is another must-read author for me, and the main reason I was interested in this collection. Her story did not disappoint! I loved the setting of a cozy bookstore, the characters that came alive with their personalities and mannerisms, and the fun romance that made me wish the story was longer. Definitely one of my favorites. My Dearest Emma is a historical epistolary story, told through letters from Johanna to her sister and relating her struggles after her husband passed away and her experiences working for a hotel. While the friendship between Johanna and Herr Jentz is sweet, there is a significant age gap that makes them hesitate to deepen the relationship. I liked how that gap seemed to close as they grew closer and allowed their care for each other to overcome their concerns. Covertly Yours was a hoot! Paisley is totally out of her element but keeps trying to make the best of it so she can survive the night. One thing leads to another and by the end of a rather eventful night, her life has changed. I loved the chemistry between her and Ice, and the way the plot developed with its twists and turns. Another favorite! A strong finish to the collection was Suspect Love, where Regean, a phlebotomist, was hoping for a promotion but had to hide her disappointment when it was given to someone from outside the company. Titus is actually a professional clean-up guy, brought in to discover who is skimming from the register and stealing from the company. He wins Regan over with his down-to-earth friendliness and she takes a risk, even though she discovers his is a temporary assignment. The setting was interesting and the characters had great chemistry.